Participants will have many opportunities to practice creative strategies including: somatic resourcing; journaling; drawing; two –handed writing; and guided imagery and visualizations all designed to install and strengthen hope, growth, and healing in clients and therapists alike. 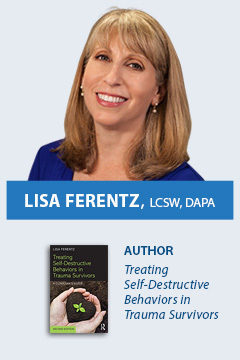 Lisa Ferentz, LCSW, DAPA, is a recognized expert in the strengths based, de-pathologized treatment of trauma and self-harm and has been in private practice since 1984. She presents workshops and keynote addresses nationally and internationally, and is a clinical consultant to practitioners and mental health agencies in the United States, Canada, England and Ireland. She has been an adjunct faculty member at several universities, and in 2007 founded “The Ferentz Institute,” which provides continuing education and state of the art training in trauma treatment to mental health professionals. Lisa hosted a weekly radio talk show, writes blogs and articles for websites on trauma, self-harm, and self-care, teaches on many webinars, and is a weekly contributor to Psychologytoday.com. You can follow Lisa’s work at www.theferentzinstitute.com, Facebook, and LinkedIn.